This jig pole weighs almost the same as out Ultra-Lite series, but designed with enough strength to pull crappie out of tree tops. This is basically a cross between our BBULBS and BRUX series. Made of a secret blend of high-modulus graphite. 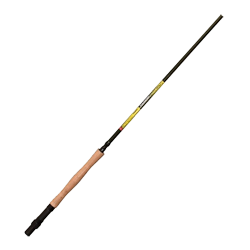 This rod features ceramic inserts, a bottom reel seat, and a contoured handle made of 100% Portuguese cork.